This post is filed under Banquet, Beef, Carrots, Frozen, Gravy, Hall of Shame (Looks), Hall of Shame (Taste), Microwave, Peas, Potatoes. This has to be the ugliest meal I’ve seen on this site yet. Terrible job, Banquet. 2% really? That’s seem off. There is no way there is only 2%, that’s a tenth of an ounce and that one chunk of beef alone is bigger than that. You should check out the TGI Friday Quesadillas then…. This blog is hilarious. Great commentary, and it’s great to not have to buy some of this crap before trying it. Bravo! I buy the Banquet Chicken pot pies quite often, and they really do look much better than this. There has always been an adequate amount of vegetables and meat, with a proper amount of gravy. We do skip eating the “chicken”. It’s nasty. But the crust, gravy, and vegetables are pretty good for something that I buy for about sixty cents. Now I know never to try the beef variety. 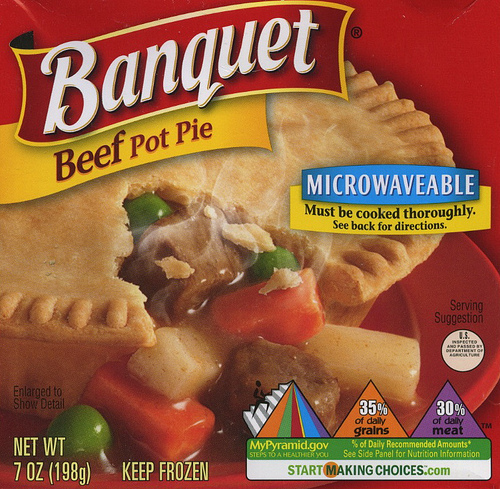 I’ve tried all of the Pot Pies from Banquet. Really, the Beef one is disgusting. I would suggest trying the Turkey Pot Pie or Chicken Pot Pie variety as those are a lot better in my experience. “Gravy pot pie” just doesn’t have the same ring to it, though. I had the same thought. Ive have this product stocked in my fridge right now… I would consider more top of the line as far as any other meat pies go. I have also noticed that some of the pies have a lot more beef in them than others so sometimes you end up with a heavenly bounty of meat and other times you get stiffed. Also I dont know if its due to the camera or possibly over/under cooking but Usually the gravy is a bit lighter like the pick on the box and you should expect that the veggies sunk to the bottom due to greater density which explains their absence in the picture. I would have to personally give this a 3.5 out of 5. I don’t much like the beef-gravy ones (the gravy taste is overwhelming, and I’m not a fan of beef gravy or beef broth in the first place), but their turkey pot pies are /amazing/. It is completely necessary to score through the top crust before microwaving them, and (if I recall correctly) before baking them. It requires a sharp, metal knife, but it makes it a /lot/ better. I also like to remove most of the edge-crust that sits on the ledge at the top of the bowl, but only some of that is because it occasionally over-crisps. The rest of it is because I take a horribly guilty pleasure in eating the delicious bits of frozen dough while the rest of the pie cooks. The beef pie now is changed. It no longer uses the same gravy. The gravy no longer is the flavor of beef. You guys back in 2009 had it great, are you kidding me? Today Banquet beef and chicken made by conagra has beef powder or chicken “powder” in the ingredients label. They compres this to make beef chunks its discusting. I would kill for a 1990’s real pot pie! And shame on Conagra for feeding America soilent green! 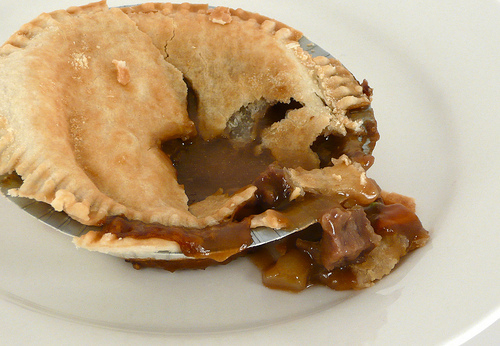 The beef in the beef pot pie tastes like diced beef boloney yuk. It also has Monosodium Glutamte (MSG). I do believe the original ingredients have changed. This was the worst I brought for a friend we found one carrot and piece of meat …I’m sorry but that was embarrassing . Just wanted to let you know that I have been eating these for years. But tonight I found 2 long silver hairs in my beef pies. And I am telling yous that it turned my stomach. Just wanted to let you know. lt wasn’t mine cause I have dark brown hair. So just be careful from now on. Thank you. Hmm……..I prefer the beef and then chicken. Fast and tasty. Anything with a crust wont look pretty if its frozen in a box unless its specially packed.